“After decades of self-imposed exile, Dave Roberts returned to England in search of non-league paradise, but only found fruit salads bursting with watermelon. “In this edge-of-the-seat thriller, Dave scales the heights (football grounds located at the top of hills) and plumbs the lows (following matches on Twitter) as he roams the country following his beloved Bromley. “He battles overcrowding on the TransPennine Express and little mongrels who like kicking the crap out of club mascots. He grapples with ever-changing fixtures and has to confront ludicrous rail fares. You may remember Dave Roberts as the author of The Bromley Boys and the excellent 32 Programmes. 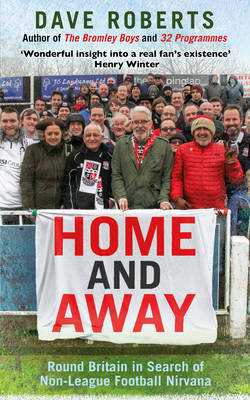 He has returned to the UK and to his obsession: following Bromley FC. Home And Away is the story of Dave rediscovering his team and his homeland. From his flat (or is it an apartment?) in Leeds, he embarks on lengthy trips to see Bromley’s first-ever campaign in the Vanarama National League. Dave invites us inside the world of the non-league football supporter. It’s a world of plastic shopping bags, train trips, programmes, and camaraderie between opposing groups of fans. Well, mostly. We’re introduced to Burnley’s die-hard supporters, and the fairly memorable “Bromley geezers” chant. Yes, it’s a funny book. Funny ha-ha. Except for the bit about fruit salad. There’s nothing funny about putting watermelon in fruit salad. Should be a hanging offence. I’m a big fan of Dave’s writing – not a big enough fan to be a member of the Dave Roberts Fan Club, it seems – and again we’re treated to a well-paced, engaging, and at times touching book. It’s a personal book for Dave. At first glance it looks like a book about Bromley’s first season in the Vanarama National League, but dig a bit deeper and other themes emerge. Without oversharing, Dave gives us an insight into his emotions not just about his team, but about the feeling of home, family, and hope. In summary: buy this book. Check out Dave’s fancy website. Or follow Dave on Twitter.